The EU project SPENCER (Social situation-aware perception and action for cognitive robots) will break new ground for cognitive systems in populated environments by addressing basic problems in making robots more socially aware. SPENCER will advance the fields of (1) perception of individual humans and groups, (2) normative human behavior learning and modeling, (3) socially-aware mapping, (4) safe operation and (5) socially-aware task, motion and interaction planning in populated environments. The SPENCER project is motivated by an end-user market-pull (for innovative solutions to guide people and efficient mobile information provision) and a technology-push (robotics has become suitably advanced to start considering humans as more than objects but as people with relationships, social rules and culturally diverse backgrounds). To this end, SPENCER will combine robotics research with social signal processing and socio-psychological user studies. The SPENCER consortium includes a large European airline (KLM) as end-user that will deploy the SPENCER robotic demonstrator for the purpose of smart flow management of transfer passengers at the Amsterdam Schiphol Airport. This deployment has a large exploitation potential and is an excellent benchmark of the research developed in SPENCER given the demanding nature of airports as highly populated real-world environments. The AASS Mobile Robotics and Olfaction Lab at Örebro University is one of 8 partners and will be funded with 322400€ (EC contribution is 241800€). The work at Örebro University will be dedicated to problems related to localization in dynamic environments and the creation of maps that indicate where different types of social behaviors occur. 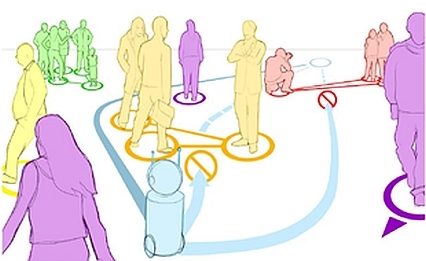 SPENCER is coordinated by the Social Robotics Lab at the University of Freiburg.